Russian President Vladimir Putin called on Sunday for immediate talks on "statehood" for southern and eastern Ukraine, although his spokesman said this did not mean Moscow now endorsed rebel calls for independence for territory they have seized. Hours later, Ukraine said a border guard vessel operating in the Azov Sea was attacked by land-based forces. Ukrainian troops and local residents were reinforcing the port of Mariupol on Sunday, the next big city in the path of pro-Russian fighters who pushed back government forces along the Azov Sea this past week in an offensive on a new front. The Kremlin leader's remarks, followed a feisty public appearance in which he compared the Kyiv government to Nazis and warned the West not to "mess with us", came with Europe and the United States preparing new sanctions to halt what they say is direct Russian military involvement in the war in Ukraine. Ukraine and Russia swapped soldiers who had entered each other's territory near the battlefield, where Kyiv says Moscow's forces have come to the aid of pro-Russian insurgents, tipping the balance on the battlefield in the rebels' favour. 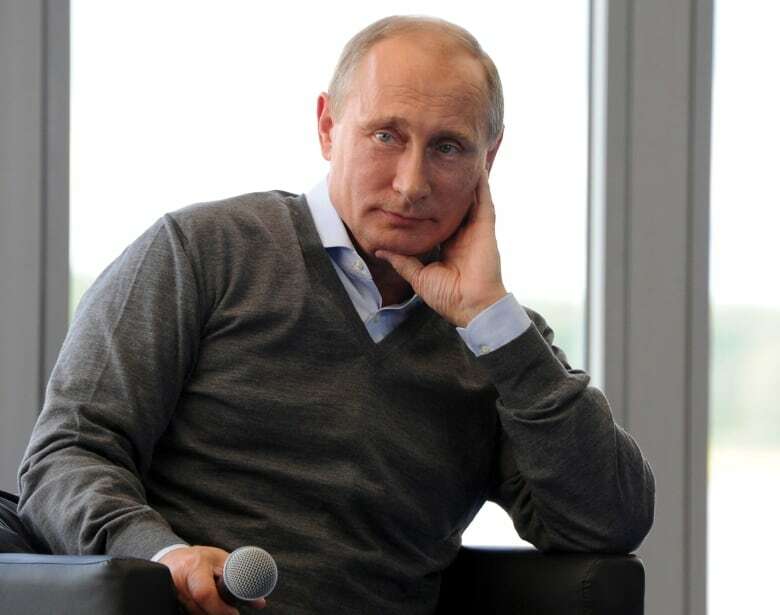 The Ukrainian government and pro-Russia insurgents should begin talks immediately on 'the political organization of society and statehood in southeastern Ukraine,' said Russian President Vladimir Putin. (Mikhail Klimentyev/RIA Novosti/Kremlin/Reuters)Talks should be held immediately "and not just on technical issues but on the political organization of society and statehood in southeastern Ukraine," Putin said in an interview with Channel 1 state television, his hair tousled by wind on the shore of a lake. Moscow, for its part, he said, could not stand aside while people were being shot "almost at point blank". Putin's use of the word "statehood" was interpreted in Western media as implying backing for the rebel demand of independence, something Moscow has so far stopped short of publicly endorsing. However, Putin's spokesman Dmitry Peskov said there was no new endorsement from Moscow for rebel independence. Asked if "New Russia," a term pro-Moscow rebels use for their territory, should still be part of Ukraine, Peskov said: "Of course." "Only Ukraine can reach an agreement with New Russia, taking into account the interests of New Russia, and this is the only way to reach a political settlement," Peskov said. Rebels have rallied behind the term "New Russia" since Putin first used it in a public appearance in April. Putin called it a tsarist-era term for land that now forms southern and eastern Ukraine. Ukrainians consider the term deeply offensive and say it reveals Moscow's imperial designs on their territory. Moscow has long called for Kyiv to hold direct political talks with the rebels. Kyiv says it is willing to have talks on more rights for the south and east, but will not talk directly to armed fighters it describes as "international terrorists" and Russian puppets that can only be reined in by Moscow. The deputy leader of the rebel Donetsk People's Republic, Andrei Prugin, said he was due to participate in talks in the Belarus capital Minsk on Monday. Past talks by a so-called "contact group" involving Moscow, Kyiv and rebels have covered technical issues like access to the crash site of a Malaysian airliner shot down in July, but not political questions. "We are proud to be from this city and we are ready to defend it from the occupiers," said Alexandra, 28, a post office clerk wearing a ribbon in blue and yellow Ukrainian colours. "We will dig trenches. We will throw petrol bombs at them, the occupiers," she said. "I believe our army and our (volunteer) battalions will protect us." Ihor, 42, and his wife Lena, 40, were packing their car to flee with their five-year-old daughter. They had sheltered in Mariupol after battle came to their home city Donetsk in July. "We will not wait for another repetition of war. We did nothing to provoke it and we do not want to be a part of it," said Lena. The swap of soldiers overnight at the frontier was a rare gesture to ease tension, but Kyiv and Moscow have given starkly opposing accounts of how their troops came to be on each other's territory. 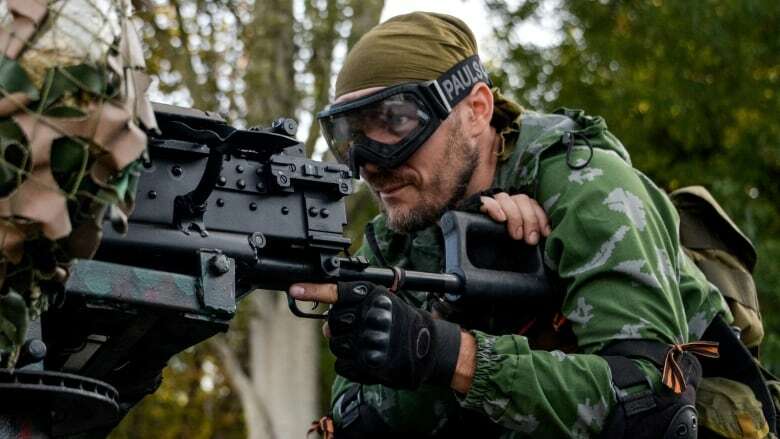 A Russian paratroop commander said an unspecified number of Russian paratroops were swapped for 63 Ukrainian soldiers. Kyiv said the Russian soldiers numbered nine. Kyiv and its allies in Europe and the United States say the new rebel offensive has been backed by more than 1,000 Russian troops fighting openly to support the insurgents. The rebels themselves say thousands of Russian troops have fought on their behalf while "on leave". 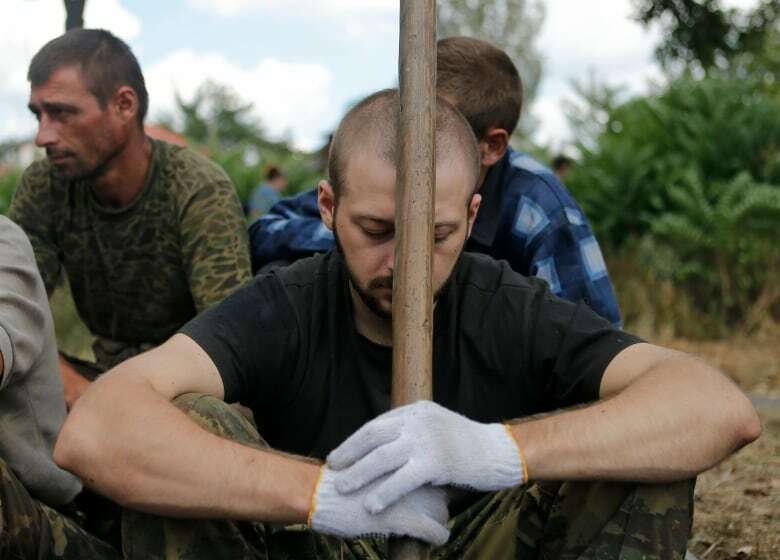 A Ukrainian serviceman captured by pro-Russian separatists in Snizhne, Donetsk region. Russia and Ukraine agreed to swap captured soldiers who had entered each other's territory on Sunday. (Maxim Shemetov/Reuters)Reuters journalists on the Russian side of the border have seen Russian troops showing signs of having returned from battle, with their insignia removed or rubbed out. Despite the evidence, Moscow denies its troops are fighting in Ukraine and says a small party of soldiers crossed the border by accident. Russian Major-General Alexei Ragozin said the paratroops were handed back after "very difficult" negotiations. "I consider it unacceptable that our servicemen were detained by the Ukrainian side for so many days," he said. "Our lads are upset about everything that happened. They will all receive the necessary psychological and other kinds of help. The lads will all be OK."
Ragozin said Russia, by contrast, had promptly returned hundreds of Ukrainian soldiers who at various times have crossed the border when squeezed by rebel forces. He said the latest group of 63 had entered Russia on Wednesday. Kyiv has in the past said some of its soldiers crossed into Russia to escape from fighting on the Ukrainian side of the frontier, behaviour that contrasts with that of the Russians it says crossed the border to wage war in Ukraine. Ukraine's military spokesman has mocked the idea that the Russians had "got lost like Little Red Riding Hood in the forest". The United States and European Union have gradually tightened economic sanctions against Russia, first imposed after Moscow annexed Ukraine's Crimea peninsula in March following the ousting of Kyiv's pro-Russian president by protesters. So far, however, the measures have done little to deter Putin, who gave a typically defiant public appearance on Friday in which he described Russians and Ukrainians as "practically one people" and compared Kyiv's attempts to recapture rebellious cities with the Nazi invasion of the Soviet Union. Russia is a strong nuclear power, and foreigners should understand that "it's best not to mess with us", he said. Moscow has responded to sanctions by banning the import of most Western foodstuffs, stripping French cheese and Polish apples from store shelves and shutting down McDonalds restaurants. The moves reinforce a sense among Russians that they are isolated from a hostile world, as in Cold War days. Agreeing the Western sanctions has been tricky, not least because the 28-member European Union must take decisions by consensus and many of its countries depend on Russian energy resources. Nevertheless, the EU has gone further than many had predicted, agreeing to impose sanctions on Russia's financial and oil industries last month after a Malaysian airliner was shot down over rebel territory, killing nearly 300 people, most of them Dutch. EU leaders agreed on Saturday to ask the executive European Commission to draw up more sanctions measures, which could be adopted in coming days. The White House praised the move to "show strong support for Ukraine's sovereignty and territorial integrity". But in a sign of the difficulty in achieving an EU consensus, the leader of tiny Slovakia said sanctions had failed so far and threatened to veto any new ones that damaged his country's national interest.